I'm a little later with this than I wanted to be, but finally I have swatches of the new Barry M Berry Cosmo polish and the new Crystal Glaze top coat! Berry Cosmo is a rich deep berry-purple creme and is a new addition to Barry M's original nail paint range. The formula is great, smooth and quite pigmented. It's another winter warmer shade perfect for this time of year! Mulled wine anyone? I used 2 coats plus top coat. Crystal Glaze is a flakie top coat. 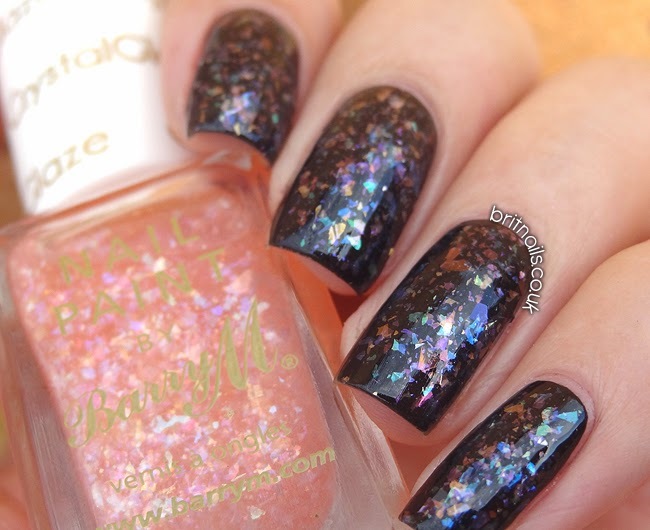 Flakie basically refers to a polish that contains shredded shards of glitter or foil that are often iridescent/opalescent in appearance. This may look like it's in a pink base but it's actually clear! It's just packed full of shredded pieces that shine rainbow colours; I can see blue, green, pink, orange and purple! It's densely packed so one coat will suffice, but I've used 2 in my pictures plus top coat. 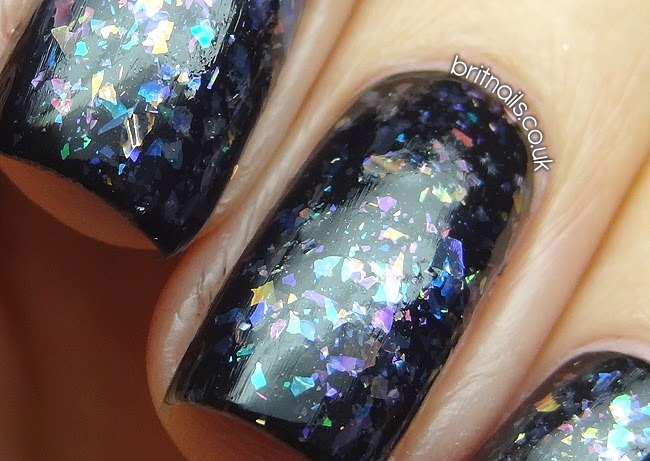 I've shown it over Barry M Black as black is the colour it pops the most with! This is a successful venture into the world of flakie top coats from Barry M (especially for the price!) If you're a seasoned pro with flakies (I am not) you may find this thicker and more densely packed than some of the other ones on offer. I may do a comparison post soon with the couple of others I own. 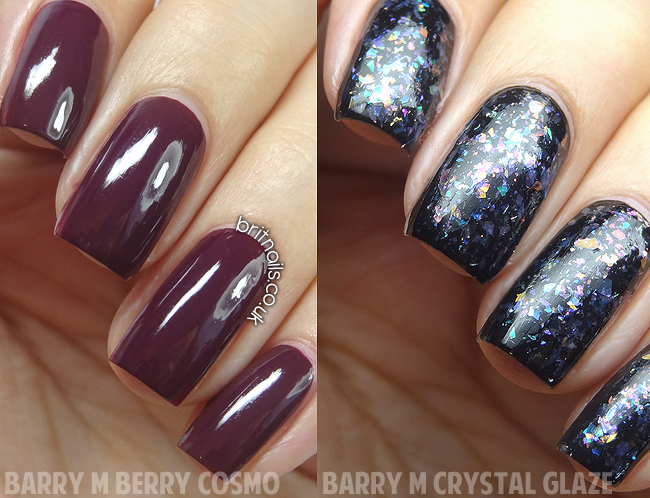 Berry Cosmo (£2.99) and Crystal Glaze (£3.99) are available now in Superdrug and will be in Boots from October 2nd. 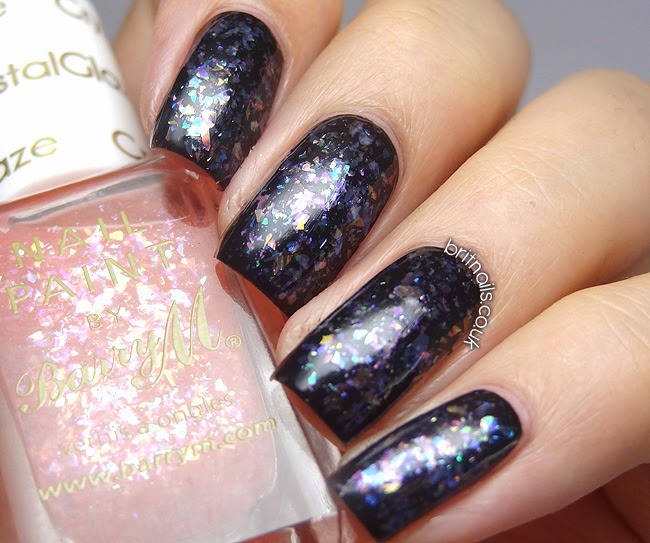 Crystal Glaze looks stunning, similar to the Revlon Moon candy things? I might have to grab this when it hits stores. Oh my goodness! Love how many colors show!! I love both of these colors! First color is so perfect for the fall season! Cosmo is a lovely shade!! I love the berry shade and the flakey top coat! Love the berry/burgundy shade. It is so autumn-like!